The Artists In Music Awards hosts its kickoff party celebrating the Season IV opener at Black Rose Tavern in West Los Angeles on July 5. 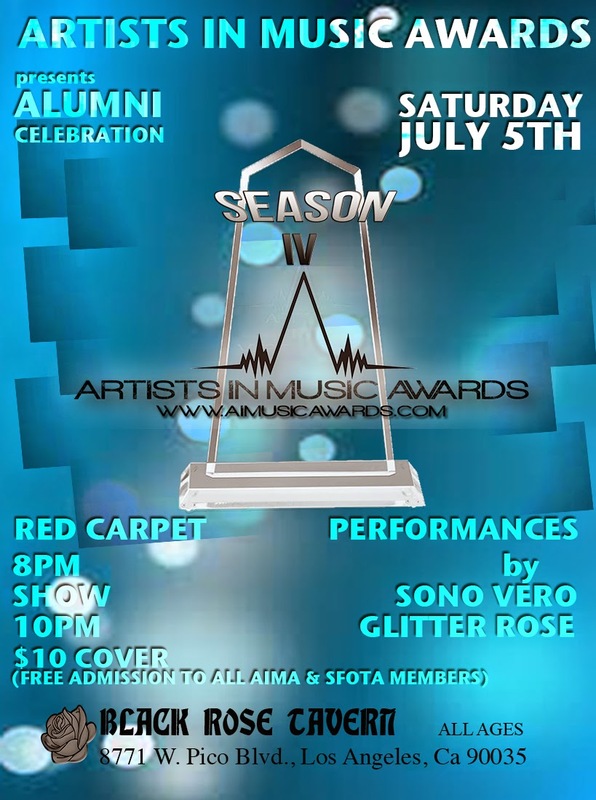 Red Carpet begins at 8pm with live performances by Glitter Rose and Sono Vero at 10pm. LOS ANGELES, Calif. -- On July 5th, two of the hottest Artists In Music Awards and most recognized recording artists will take the stage at newly remodeled Black Rose Tavern (formerly The Joint). Glitter Rose is the program's most decorated artist with 8 awards including 6 awards received by the organization (2014 awards include Artist of the Year, Performer of the Year, Best Music Video for "Buda Negra", and Best Southern Rock Artist. 2013 awards include Album of the Year for Dead or Alive and Best Rock Artist). In 2014, Sono Vero won the award for Best Reggae Artist at the 3rd annual AIMA event held at Universal Citywalk on February 7. This will be the first time these two artists will perform together and this is the first time Sono Vero will perform for AIMA. Glitter Rose originally won a spot to perform at the Awards Ceremony when she unanimously received the highest scores at the Breakthrough Series contest held at House of Blues in 2012. Since 2012, Glitter Rose has performed a total of a dozen shows for AIMA over the course of three years. With 12 endorsements and 6 sponsors behind Glitter, this makes her one the most recognizable and most sought after artist in independent music. Established in 2011, the Artists In Music Awards was originally created to honor and recognize the most talented and gifted artists. Over the years, this tradition has evolved beyond the recognition of a singular art form with a desire to encompass all areas of Arts & Entertainment. On April 28, 2014, Artists In Music Awards joined forces with the Siqueiros Foundation of the Arts. SFOTA is a non-profit organization with two goals in mind - the dedication to empowering creative youth by providing scholarship opportunities to underprivileged children and providing an avenue to explore and express the arts through unity and community involvement. SOFTA is also dedicated to creating jobs for out of work artists using Federal aid through the resurrection of the Federal Art Project (FAP), a program with a focus on putting Artists back to work, but disappeared after the end of the Depression Era in 1943. Now under the Siqueiros Foundation of the Arts, this is not only a new chapter for the Artists In Music Awards, but an exciting opportunity for all artists to be apart of. As a member of the AIMA and SFOTA comes with special privileges including exclusive access to special events, FREE awards submissions, workshops, discounts on premiere affiliated art exhibits and award events, plus voting privileges on AIMA categories.